Address Plaque with 5 Offset Numbers- - holds five bold 3" or 4" dimensional characters. Suitable for an address number with 5 digits, such as 55555 Blvd. Horizontal or vertical orientation. Made in USA. 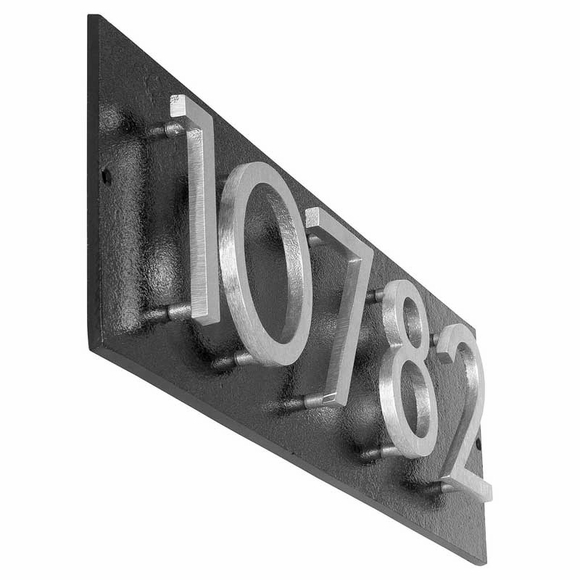 Includes five raised floating solid cast aluminum numbers on a 1/4" thick solid aluminum backplate with either a horizontal orientation or vertical orientation. with 3" numbers: 4.5"H x 14.8"W x 1" thick. with 4" numbers: 6"H x 19.75"W x 1"thick. with 3" numbers: 17.625"H X 3.375"W X 1" thick. with 4" numbers: 23.5"H x 4.5"W x 1" thick. Address Plaque with 5 Offset Numbers holds five dimensional characters. Made in USA. Our newest ultra chic address plaque is a high quality, contemporary custom sign at an incredibly affordable price.